Everyone loves fresh Cilantro. We have a very simple method for growing your own Cilantro in a continuous easy way. This method shows you how-to by starting the seeds in your home first and avoiding the hot direct sun in the very beginning. Step 3 – Before adding the seeds you must moisten the fresh soil using a spray bottle or a garden hose. Step 4 – Because the seeds are small you must mix them in a bowl with sand (3 parts of sand to 1 part of seeds) so they will disperse in a more even matter. Step 5 – Sow the seeds and then cover with soil lightly. Step 6 – Gently mist the TOP soil so the seeds have a moist top soil. Step 7 – Place the container in the full sun. (If you live in a hot climate then light shade) Seeds should germinate within 7 to 10 days. Step 8 – When the cilantro is ready to harvest, cut the cilantro leaving a few inches of it still sticking up from the soil. Do this weekly to keep the cilantro leaves coming. 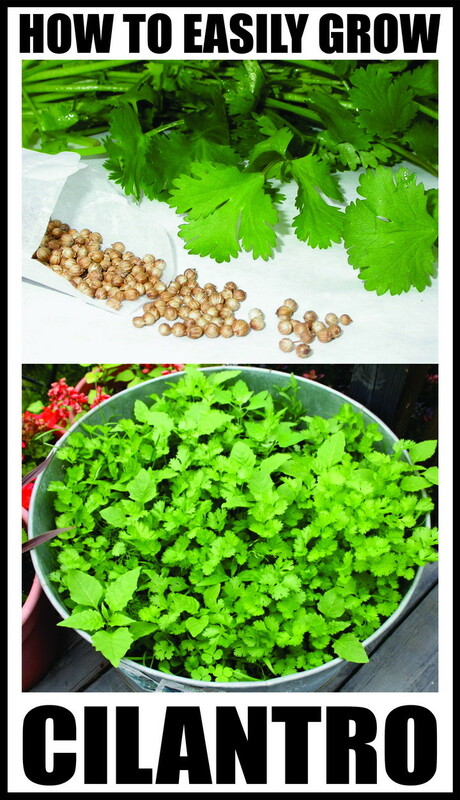 Using this quick harvest method it is possible to harvest four crops of cilantro from a single pot.